I first visited Obaidullah at Guantánamo Bay in the spring of 2009. Before that first meeting, all I knew were the disturbing accusations against him, that he had fired his last habeas attorney, and that I wasn’t sure why. Prior to the visit, my family and colleagues were supportive. When I confessed to a close friend that I was nervous, he said, “Time to get out of your comfort zone.” That was an understatement. My law partner gave me the pep talk about everyone being entitled to representation, but I wasn’t even a criminal defense attorney. Hardly any of us in the “GITMO Bar” were. According to what had been scared up through a Freedom of Information Act request, Obaidullah was accused of being part of an Al Qaeda-affiliated cell that was preparing roadside bombs against U.S. and allied forces in Afghanistan. Official reports said he confessed while in custody in Afghanistan. Later, at Guantánamo, he’d recanted, saying he’d been tortured and the confession coerced. Was my client guilty of terrorism? Who knew! There had never been any test of guilt or innocence, just six years of reported interrogations and torture. Here was a face to put to the name; here was a man struggling to understand who I was, and whether he could trust me. In those early days, most of the Americans he had met had been military or intelligence personnel. His first attorney had failed to gain his confidence. So many lawyers were fired by their clients at GITMO that it was a running joke among the attorneys. Just stay hired, I told myself. That’s the first step. 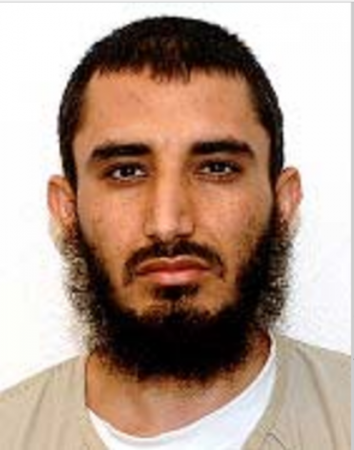 Official Guantanamo photo of Obaidullah. For me, this journey to GITMO had started with a simple request. My law firm was asked by the Center for Constitutional Rights to represent a single detainee in Guantánamo Bay in his habeas proceedings. The Center had filed the first lawsuit on behalf of the roughly 780 men detained there as enemy combatants, and was co-counsel in the 2008 Supreme Court decision securing their right to judicial review. But a large number of these men, who had been detained for up to six years, still did not have attorneys who were willing, pro bono, to contest their imprisonment. The Center was reaching out to law firms nationwide, building a “GITMO bar” to take these cases. Would our small firm be willing to handle just one? Obaidullah (as with many Afghans, he has only one name) had been arrested at his home during a raid in the middle of the night. No charges were leveled against him until 2008 (after six years of detention). They included conspiracy and material support for terrorism. Later, in 2011, a military lawyer assigned to his defense team found evidence to support Obaidullah’s claims of innocence, including substantiating his family’s claims that the seemingly incriminating mines had actually been left there during the Soviet occupation, while he and his family were in Pakistan. Although his military lawyers sought a speedy trial, the U.S. government simply dropped the charges. The government didn’t need them. They could rely on indefinite detention instead, as they did with most of the other Guantánamo detainees. Detention without charge. Obaidullah remained in custody at Guantánamo for another five years until his release in 2016, and 31 men remain in the same situation today with no charges pending. How do you establish rapport with someone without any shared cultural reference points? Obaidullah had been living on a small farm and working in a general store in rural Afghanistan outside of Khost, a two and a half hour drive from Kabul. His entire life had been subject to the ebb and flow of the constant state of war in Afghanistan, from the Soviet invasion to the Taliban takeover. 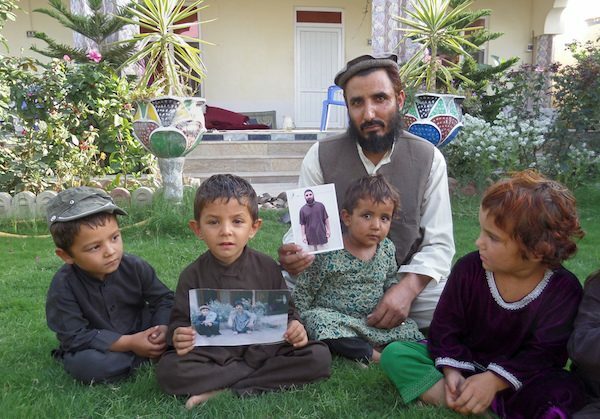 His family bore no love for the Taliban. He had an 11th grade education and had learned a little English in school. Before being captured, he thought that Britain was more powerful than the United States, so little did he know of the world outside his village. Once captured, he had no access to any outside information about his fate; he relied on what other detainees, guards, or interrogators told him. He also had no way to find out anything about me. It wasn’t until after our habeas hearing, in which he had been allowed to listen remotely to my public opening statement (the rest was classified and not even he was allowed to hear it), and saw how hard we had worked for him, that I think he let himself believe in me. For my part, meeting Obaidullah face-to-face removed any doubt about what I was doing. At the time of his capture he was recently married—his daughter had been born just days before U.S. forces took him from his home. To this day I know his daughter’s age. My own son had been born the same month. Obaidullah told me he was tortured at Bagram Air Base, and that the abuse continued in interrogations at Guantánamo. Not until later, after we’d known each other for several years, did he tell me what happened. He signed a statement that we filed in court describing what the judge called “enhanced interrogation techniques.” International law calls it torture. Obaidullah described being beaten on the head with a gun and threatened with death by a guard who was sharpening a long knife. He was forced to carry sandbags all night and not allowed to sleep. He was kept in a small barbed wire cage. His hands were tied above his head for hours. He was subjected to extreme heat and cold over many months’ time. 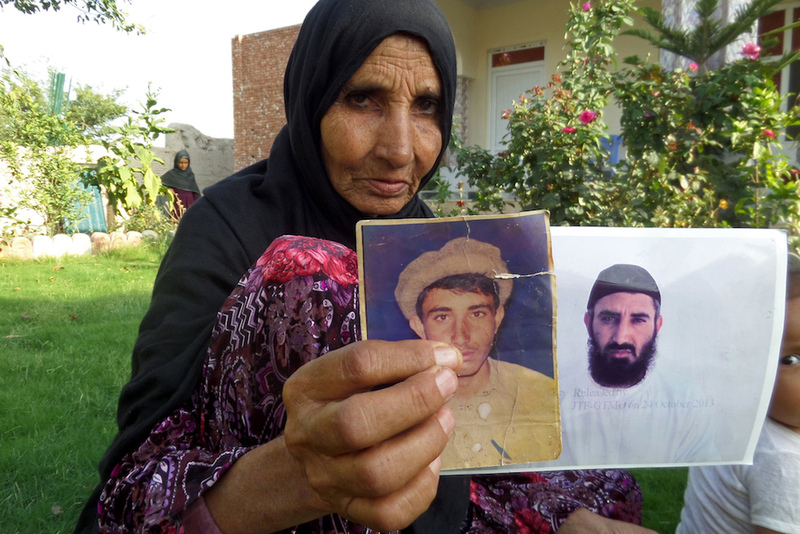 Fazel Karim holds a picture of his brother, who was recently released from the Guantanamo Bay detention center. Obaidullah asked me why I was trying to help him. I told him that I believed that everyone should have the right to present their evidence in court, and that I understood he had little hope my government would do the right thing, and that I was committed to doing everything I could to allow him to have a hearing. It sounded pretty theoretical and pie-in-the-sky, even to me. We talked about President Barack Obama’s promise to close Guantánamo Bay, which had been delivered just months before my first visit. We talked about the political battles that made it hard for Obama to fulfill that promise. Over the next seven years, I went to Guantánamo Bay a dozen times to meet with Obaidullah. For his habeas hearing we coordinated multiple attorneys and expert witnesses, and pulled together a brief that was over a hundred pages long with more than a hundred exhibits. But we still lost. After the Supreme Court in Boumediene granted detainees the right to petition for release through the writ of habeas corpus the D.C. Circuit Court of Appeals never again approved of any detainee’s release, and the system ground to a halt. My colleagues and I went often to Guantánamo to meet with Obaidullah. We were the only ones allowed to, after all. We talked movies, children, pets, family, books. He liked My Big Fat Greek Wedding and the Fast and Furious franchise. He was a fan of How I Met Your Mother. Over the years, we had shared with him tales of our honeymoons, camping trips, and trekking tours around the world, and in one of our last conversations before his release, he told me that he liked in particular our habit of taking vacations with our families. Family travel, he told me, was not something he had heard of, and he looked forward to trying it with his. I told him that I believed that everyone should have the right to present their evidence in court, and that I understood he had little hope my government would do the right thing, and that I was committed to doing everything I could to allow him to have a hearing. We lawyers were sometimes allowed to bring in food, and we tried to anticipate what he might like—mocha ice cream was a favorite (though it nearly melted by the time we got back from the Navy Exchange where we bought it during lunch). Nutella spread onto a biscuit with a military-issue spork was also a hit. Sometimes we talked about having a proper meal together outside the prison, after he was freed. What amazed me the most was Obaidullah’s compassion—at this point, under these circumstances—and his ability to express empathy and appreciation, even humor. He began our visits with inquiries into the wellbeing of our families, and recalled what we’d told him about their interests in soccer and science. When one of our lawyers dropped her cell phone into the bay he found that a rich vein for relentless teasing, as he did if we were late to a meeting. During our regular phone conversations, which I took from home as they were scheduled very early West Coast time, he loved it when my dog barked: It was a small but vivid reminder of the real world. Since 2002, nine detainees have died at Guantánamo. Of those, at least one died of an apparent suicide and another from injuries sustained while in U.S. custody in Afghanistan. With the situation looking hopeless, the prisoners felt that refusing to eat was the one means they had to register their protest. In 2013, with transfers out of Guantánamo Bay at a complete standstill, the majority of the men in the camp began a hunger strike. In part as a result of those desperate hunger strikes—my client withered to about 120 pounds—Obama instituted Periodic Review Board hearings that would assess whether each detainee currently constituted a threat, regardless of what he may or may not have done in the past. In December of 2015, Obaidullah was informed that he was scheduled for a hearing before the Periodic Review Board, and in April 2016, I went down for 10 days to prepare for and participate in the hearing as his private counsel. In May, we were notified that he had indeed been cleared for transfer, and this past August, he was finally released from Guantánamo Bay to the United Arab Emirates. He has been placed in a government rehabilitation program there. I won’t be able to hear from him for many months. It will not be easy for him to readjust to the world after suffering what he has been through, or to live as an Afghan immigrant in the UAE. His future is unclear—after a few years he should be able to return to Afghanistan. That too will be no picnic for a former detainee. But one thing is clear. The minute I am given the go-ahead, I plan to take my son and husband, go meet his family, and share that meal outside the prison walls. Anne Richardson is director of the Consumer Law Project at Public Counsel. She represented Obaidullah along with attorneys at Hadsell Stormer & Renick, where she worked when she first took the case, and at the Civil Rights Clinic University of Texas Law School as well as with his military defense counsel team and numerous volunteer attorneys, students, and paralegals. *Lead photo: Obiadullah's mother holds pictures of her son, who was recently released from the Guantanamo Bay detention center. Lead photo and second interior photo by Nishanuddin Khan/Associated Press. First interior photo in the public domain.